“Detonation” by Burr Anderson revolves around the attempt of several unscrupulous individuals to thwart the use of the new third lock of the Panama Canal with radioactive material. Brick Morgan, a maritime investigator, just returning from a mysterious person overboard on the Bernini Under The Stars cruise liner, has been tasked to stop this potential disaster. Crime boss Gaston Rizzo is behind this incredulous plot along with several other cohorts who could make millions of dollars if this scheme is successful. As the FBI becomes involved, Morgan teams with Agent Nicole Colfield and they both are stunned at the lack of concern by port authorities. In addition to Colfield, Morgan gets help from his good friend Rilee who is a secret hacker. Even though Morgan loves the information Rilee provides, he is concerned she will be found out, putting both of their lives in danger. Anderson provides all the characteristics of a great plot; though it is delayed by the beginning story of the arrogant lawyer and his wife’s death aboard the cruise ship. The pace drags with minute details that are not advancing the plot. I found all the various characters to be overwhelming and had to keep going back to see their role in the plot. Some of the minor characters Angela, Avery’s long time girlfriend and Emily, a live-in housekeeper for the Bancroft’s appear to be just fill-in characters in this plot. I found the behind scenes of the cruise line to be quite interesting, as I never considered coded tags to be used to identify ships, their destinations and which dock they could use. I also found it interesting how specialists on a ship detected missing equipment or any potential explosives. The story really picked up the pace around Chapter 20, with each chapter ending in tick tock. 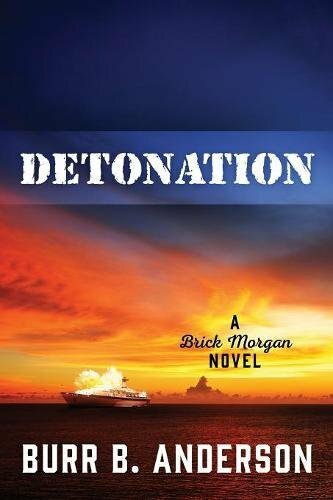 Even with the early distractions, “Detonation” by Burr B. Anderson is quite intriguing with well researched information on forensics, size and coding of ships, and possible attacks on the Panama Canal, by those who wish to gain millions of dollars or even terrorists who would like revenge.